Superstorm Haiyan made a devastating landfall in the east-central Philippines on November 8, 2013, leaving behind a trail of death and destruction that draped the whole country in a pall of grief. The Philippines has since been reeling from this disaster. 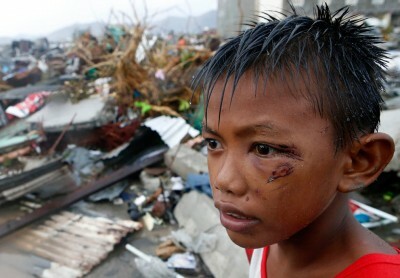 The typhoon buffeted the most vulnerable of Filipinos, 40% of whom live below the poverty line (i.e., $1.25 a day). Many of them fished for a living. Their livelihood compelled them to live dangerously close to the shoreline of western Pacific. The highest ground on which some of them found their perch was just one meter above sea level. When the storm swelled, with waves as high as six meters, its poor victims were defenseless. The crashing walls of water swept away all that they possessed. The cumulative losses in lives and livelihoods, homes and hearths, businesses and infrastructure have no parallel in recent Philippines history, just as Haiyan stands out in the annals of meteorology. Two years on, 13 million Filipinos, of whom 5 million are children, are still scarred by the destructive fury of Haiyan, while 600,000 remain homeless. The number of deaths from the superstorm surpassed 6,000. The staggering scale of humanitarian crisis that followed Haiyan’s landfall was well beyond the capacity to respond of the under-resourced and overstretched Philippine government. Oxfam found it even overwhelming for the global humanitarian assistance system. The largest brunt of recovery efforts fell on the Philippines itself, which Haiyan had already bled of precious resources. Its economic losses alone were valued at a whopping $15 billion, which constitutes 5% of the Philippines’s Gross Domestic Product (GDP) of around $300 billion. In the face of a slow-down in global and regional economies, it will take the country many years of hard work before it recovers its bearing. As a nation of 7,100 islands, the Philippines sits on the front line of global climate change. This tragically means typhoon Haiyan is not the last of nature’s bites that Filipinos will have to endure. As climate change begins to impose dire costs, more such disasters loom ever larger on the horizon. The Philippines has already borne the brunt of worsening climate change in economic losses of $1.6 billion per year–from increasingly frequent and intense typhoons. Bangladesh’s Minister of Foreign Affairs Dipu Moni reckons that 1 degree Celsius increase in world temperatures will be enough to spell economic disaster for her country, as it will shave off 10% of its GDP in economic losses. Destruction from Super-cyclones such as Sidr, she reasons, takes 10 to 20 years to recover, and costs billions of dollars. There are projections that temperatures in South Asia could rise from two to five degree Celsius above preindustrial levels by the turn of the century. At 5 degrees Celsius, the temperature rise will be 250% higher than the expected global mean warming of 2 degrees Celsius. Rising temperatures are the motive force that powers tropical cyclones and superstorms of which Bangladesh has been the world’s worst victim. Future is thus fraught with predictable hazards for Bangladesh, whose vulnerability to deadliest storms is only to worsen in the years and decades to come. Of the world’s ten deadliest superstorms on record, six have visited upon Bangladesh: Bhola Cyclone, Hooghly River Cyclone, Backerganj Cyclone, Chittagong Cyclone and Cyclone 02B. Bhola Cyclone (1970) is believed to be the world’s deadliest to date with a death toll of more than half a million. If climate change continues to worsen, Bangladesh’s troubles will continue to multiply. Even worse, the island nation of Maldives, which is barely 1.5 meters above sea level, will vanish from the face of the earth in the next 50 years, as the global average temperature continues to rise. A nation of 1,200 islands, 30 of its islands were swept away in the tsunami in 2004. Five years later, in 2009, Maldives’s President Mohamed Nasheed struck the world with a blunt call for ending fossil fuel consumption to save his country of 328,000 people: “If the world can’t save the Maldives today, it might be too late to save London, New York or Hong Kong tomorrow.” He pledged to make his nation carbon-neutral, running it on 100% renewable energy. Anticipating challenges that could forestall passage to a carbon-free Maldives, he reasoned: “Going green might cost a lot but refusing to act now will cost us the Earth.” He was deposed in a coup in 2012. He again lost a presidential bid in November 2013 as beneficiaries of the status quo managed to keep him out of power. Nobody knows “who” won the Maldives’s election, but everybody knows who lost it and why. President Nasheed nonetheless, retains his role as a climate crusader, whom many revere. The Hollywood Director Jon Shenk honored his work for climate justice in a memorable documentary, The Island President (cf. Murray’s review of “There Once Was an Island” in this issue). In May 2008, Super-cyclone Nargis flatted part of Myanmar (Burma). The delta region of Irrawaddy was the prime site that absorbed the devastating blow of the deadly cyclone. The loss of human life ran into the tens of thousands although the correct number remains unknown to this day due to the ruling military government’s absolute control of information. The Guardian newspaper had put the number of dead in Cyclone Nargis at 140,000. According to the government’s own reckoning, 84, 500 were killed and 53,800 went missing in the country’s worst cyclone. It may be noted that in disaster after disaster, it has been confirmed that those who go missing remain unaccounted for and are seldom found alive. In parallel, the numbers of those affected by the destructive cyclone were in the millions. The United Nations estimated that the Cyclone had affected 2.4 million people across the country. More importantly, the political economy of Myanmar further worsened the impact of the cyclone as the military junta in power put the entire country in lockdown, and refused to let in international relief agencies for fear of ‘spying.’ On the other hand, the Myanmar government, battered by decades of international sanctions and worldwide shunning, lacked resources of its own to undertake a massive relief operation. Cyclone Nargis thus revealed the soft belly of the government to the country’s suffering people. They challenged the government’s inability and incompetence to help its people in the most desperate hour of need. Rattled, the government rushed to strike a deal with its world’s most famous opposition leader, Nobel-laureate Aung San Su and her National Defense League (NDL). Three years later a quasi-civilian government took the reins of government. But the cyclone-fueled and monsoon-swelled disasters have since continued to strike. As recently as August 2015, all but one of the country’s 14 provinces were swept by flash floods from lashing monsoons, while rescuers struggled to reach disaster-stricken areas. At least 27 people were killed in these floods and more than 150,000 affected. More importantly, monsoon fury was not limited to Myanmar, but extended to the entire region from India, Nepal, and Pakistan to Vietnam. Like the Maldives, Sri Lanka also is precariously perched in the heart of the Indian Ocean. Known for its stunning scenic beauty, this island nation has long been convulsed in a self-destructive war. It has just staunched its bleeding, but it still has a long way to go to bind up the deep wounds. At the same time, Sri Lanka has many bright spots. It leads south Asia in economic development (measured in per capita income), social progress (measured in adult literacy), gender equity, and climate-readiness. It is a Kerala — the beauty spot of south Asian social democracy — on the national scale. Yet climate-induced disruptions stare at it as the greatest threat to its survival over the next half century. “Its agriculture, fisheries, and tourism are particularly vulnerable to rising sea levels and weather-related disasters,” reports The Guardian. Likewise, the coastal communities of India and Pakistan – in that order – run the same risk of being deluged as sea levels rise. In 2010, Pakistan experienced the worst flooding of its history in human dislocation, and economic losses. The flooding was described as a once-in-100-years event that forced 20 million of its residents from their homes, and cost the country $20 billion (one-tenth of Pakistan’s GDP of $200 billion in 2010) in economic losses. Pakistan pressed all of its military assets – army, navy and air force – into service to help ease the suffering of millions of Pakistanis living along the shoreline of the mighty Indus River. Yet help could reach only a fraction of 20 million displaced people, as one-fifth of the country (160,000 square kilometers) was under water. A year after, in 2011, Pakistan again witnessed monsoon-swollen flooding wreak havoc, dislodging another 6 million of its citizens. The floods have since been a regular occurrence that leaves the rural hinterland of the country, along the Indus shore, ravaged year after year. In 2015 the impact of floods was worsened by a heat wave that killed around 2,000 people in the mega city of Karachi. The floods and heat waves have been a regular feature of the Indian landscape as well. The floods in Uttarkhand and the state of Jammu and Kashmir were devastating, which dominated the news for days and weeks. The 2015 heat wave also added fuel to the fire, killing a number of people in urban areas. Fragility of the African continent is no less sobering. Drought, desertification, livestock fatalities, infectious diseases, food shortages and water scarcities already stalk the length and breadth of the region. Climate change is sharpening the lethality of these murderous challenges, and exacerbating the conditions of environmental decline in general. The giant nations of Africa, such as Congo, Libya, Nigeria, Somalia and Sudan, are already in the throes of ecological depletion. Their political conflicts are deeply anchored in their fragile ecologies. However, African sufferings may go unnoticed, as they are less likely to take the form of visually spectacular disasters on the scale of Hurricane Katrina, Superstorm Sandy or Typhoon Haiyan. Climate-induced disasters may yet trigger epidemics, large-scale human fatalities, or mass migration that would thrust the continent on to the world’s retina. It will likely occur because of sudden overheating of the continent. It must be remembered that Africa is already the warmest continent on the planet. Libya is the continent’s thermal powerhouse, whose citizens are known to have endured the world’s peak temperature. Just as a few degrees warmer water in the Atlantic or the Pacific can spell disasters, so can a few degrees warmer atmosphere. For all these reasons, Africa is as much in the eye of superstorms as are Asian nations. Africa stands threatened by the warming of the atmosphere that can set off a trajectory of destructive events. It is particularly fraught with climatic threats of epidemics, human fatalities, or mass migration, compounded by political conflicts that sear the entire continent. The Science of Typhoons A section of meteorologists are still dismissive of causal links between climate change and the production of cyclones, typhoons, hurricanes or superstorms like Haiyan. Such dismissals, however, only feed into climate skepticism. The science of typhoons and climate change is quite clear. When the IPCC released its fifth assessment report on September 27, it confirmed warming of the atmosphere and overheating of the oceans — the latter is responsible for the production of cyclones. When sea surface temperature hits 26 degrees Celsius, a cyclone is formed. When oceans are a few degrees warmer than normal, superstorms begin to brew. Superstorm Sandy burst out of the Atlantic coastal water that was about 3 degrees Celsius warmer than normal. Similarly, surface temperature of the western Pacific was 1 to 5 degrees Celsius warmer in 2013 than its average range in 1980-2000. Warmer oceans evaporate faster to power the storm, and warmer atmosphere holds more moisture to cause rainstorms. 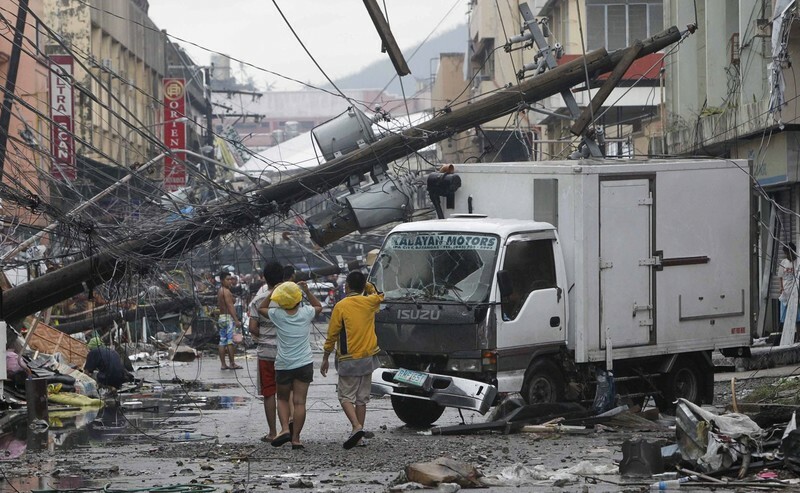 Massachusetts Institute of Technology (MIT) atmospheric scientist Kerry Emanuel, who also serves on the IPCC, sees clear connections between the warming of the oceans and the production of high velocity winds and storm surges as witnessed in Haiyan. He went so far as to suggest that developing nations such as the Philippines are suffering for the sins of developed countries that followed the path of carbon-heavy development. He stopped short of suggesting compensation for climate mitigation to developing nations. But financing of climate adaptation has been an important part of climate change talks since the Copenhagen Conference in 2009. Haiyan’s landfall only added to the urgency of this need, which happened to time its landing with climate talks (COP 19) in Warsaw, Poland (November 11-22, 2013). These talks are held each year in the run up to crafting a binding climate treaty in 2015 to replace the Kyoto Protocol. One important outcome of the Copenhagen Conference was the financial commitments by developed nations to help less affluent nations in adapting to climate-induced disruptions. Initially, developed countries committed $30 billion for 2010-12, and pledged to increase this commitment to $100 billion a year by 2020. Oxfam, however, deflated such hopes in an analysis, which showed that developed nations had begun to wriggle out of even a modest commitment of $30 billion spread over multiple years. It further dampened any prospect for redeeming the grand pledge of $100 billion a year in climate finance by 2020. The IPCC in its fifth assessment report (2008) concluded with 95% certainty that humans are at the root of climate change. This conclusion seems an official inauguration of Anthropocene, the age of human extravagance, in which humans have evolved or (more appropriately) devolved into a geological force on the scale of volcanoes, earthquakes, and tsunamis to have altered the atmosphere, hydrosphere and biosphere. In the process, this hubris has hung a huge question mark over the very survival of the human race on this planet. Yet all humans are not equally destructive; nor are they equally vulnerable. Many, as in the Philippines, are victims of the actions of the few who are driving climate change and planning to profit from it at the same time. Among them, the fossil fuel industry and its beneficiaries, who are accumulating $1.9 trillion a year in subsidies, in addition to immense profits, sit atop. Climate change is the sin of their profiteering, for which the global poor are atoning with their lives. As the Philippine delegate to the United Nations’ climate talks in Warsaw tearfully pleaded, this madness must end. It doesn’t make sense to sacrifice the primary Earth economy for the illusory secondary human economy that is measured in the piles of worthless paper money built by “quantitative easing” (printing money). The Asia-Pacific is the region most vulnerable to global climate change. 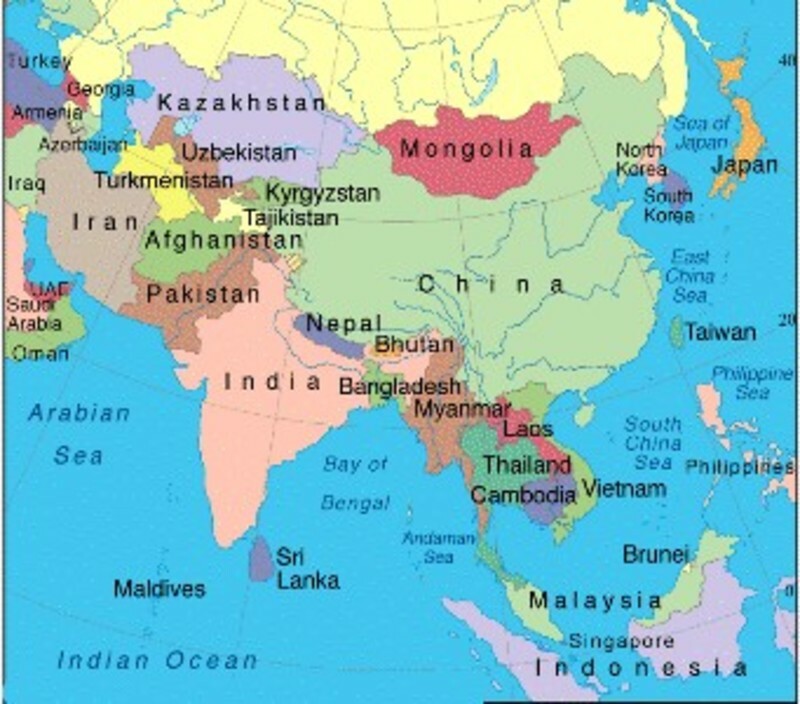 It is the world’s most populous region with the highest population density, settled along the long coastlines of the Indian and the Pacific oceans. Its sub-regions have varying levels of vulnerabilities. South Asia, which is the world’s most populous sub-region with 1.7 billion people, houses half of the world’s poor, and is home to 17 of the world’s 20 most polluted cities. All this readily translates into human disaster and economic destruction if meteorological events become uncontrollable with supercyclones and superstorms such as Typhoon Haiyan or disastrous floods that have been stalking the region since 2008. The African Indian Ocean also is lethal for Africa’s coastal nations, such as Somalia and Ethiopia, which are vulnerable to calamitous monsoons rising from the Indian Ocean, creating unbearable human and economic costs in droughts and deluges. Coastal and Island nations in the Asia-Pacific, such as Bangladesh, Maldives, Philippines and Sri Lanka, have contributed the least to global climate change, but will suffer the most from climate breakdown. Climate justice demands that nations that contributed the most to global climate change make comparable contributions to the United Nations Green Climate Fund to reverse the tide of climatic and meteorological disasters that have grown to become a permanent feature of the planet. Ironically, the Green Climate Fund is one of the main obstacles to reincarnating and strengthening the Kyoto Protocol in Paris by the end of this year. If the Paris summit on climate change ends without a meaningful climate pact to replace the Kyoto Protocol, human suffering will continue to grow. It however bears reminding that human misery does not stay in one place; it reappears in the unlikeliest of places. It is therefore imperative that the world invests in climate mitigation and climate adaptation to reduce the human and economic cost of climate change. Tarique Niazi, Ph.D., is an Associate Professor of Environmental Sociology at University of Wisconsin-Eau Claire.